You can find other 2 functions of Wondershare DVD Creator Toolbox, which are Data Disc and One-click to Burn DVD Disc. Follow the step-by-step guide to achieve this 2 functions. Data Disc allows you to burn video/audio/image files to DVD/Blu-ray disc as backups. Launch Wondershare DVD Creator and choose More DVD Tools >> option from the homepage, then you'll come to the Toolbox page. You can also select Create a DVD Video Disc or Create a Blu-ray(BDMV) Disc and click Toolbox in the top right to view the embedded Toolbox. Choose Data Disc option from the 9 functions in the toolbox, and you'll get a new interface of burning Data Disc. Follow the same steps in How to Burn Data Disc >> to finish your data disc burning process. You can burn videos/images to DVD in a quick way. One-click to burn files to DVD without menu and keep original. 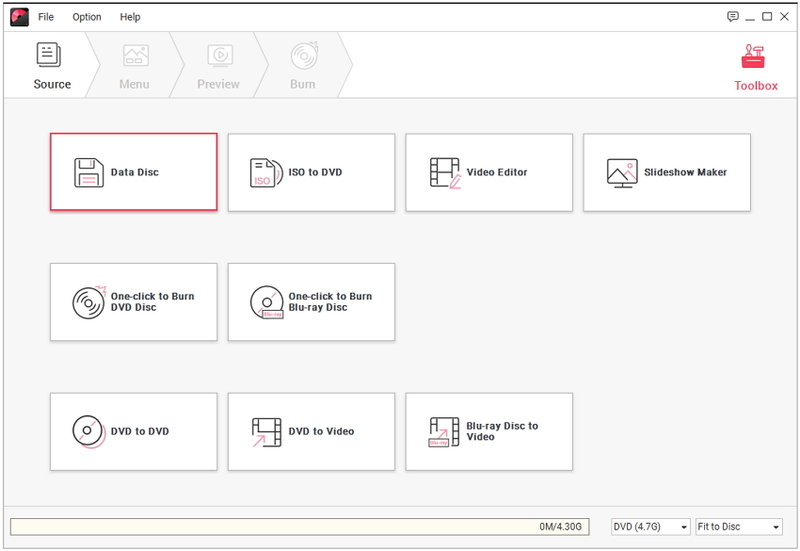 Click More DVD Tools >> option on the main interface after you have launched Wondershare DVD Creator, and a new window named Toolbox will open. You can also select Create a DVD Video Disc or Create a Blu-ray(BDMV) Disc and click Toolbox in the top right to view the embedded Toolbox. Choose One-click to Burn DVD Disc option from the toolbox, then a burning window will open. Follow the same steps in How to Burn DVD Disc in One Click >> to finish your DVD burning quickly.